The Meccas of technology and management education in India, the Indian institutes of Technology (IIT) and Indian institutes of Management (IIM), are the stuff dreams are made of. Cracking the admissions process in either of these is in itself a cause for celebration for the entire family, for a degree from these esteemed institutes conjures up images of a nice job with a lucrative pay package. One needs to accept that there is a perception of IITians going after the unchartered territories and making it big with an idea, while the MBA graduates slog it out in the big, bad (or wonderful) world of management for big bucks and a better designation. It is rarely the other way round. Why are IITs considered as the breeding ground for start-ups, and not IIMs. Well, there are lots of theories around it. Let’s take them on one by one. The basics first. IITians are taught engineering, science and all technical aspects. The IIMs, on the other hand, impart management education and research. IITians are supposed to have an upper hand straight from there. With a sound knowledge of technology, how it works and how it can be made to work, is something that holds them in good stead right from the start. Considering that most start-ups these days take the app way to grow in business also gives them the edge. Many such start-ups have technical wizards in the founder list. Needless to say, it always helps. Managers, on the other hand,are trained to look at a business holistically. Do any amount of research online on the subject and most commentaries would invariably say that IITs train their wards into ‘innovation’. The idea there is to make them create a product from the scratch and become responsible for its success. If one of their innovations doesn’t succeed, well they are encouraged to start all over again. So, these guys tend to have the never-say-die spirit or so it means. The IIM graduates are given training to manage an existing entity, assess it, analyse it and take up measures that will keep it going, in a better way. The whole exercise is supposed to ensure they learn how to manage things. Some students believe the IITians are required to exhibit ‘strong analytical skills’ which works for them when it comes to launching a start-up. There are a total of 16 IITs across India while the number of IIMs is 19. The sheer number is something of a differentiator. According to some statistics in 2015, around 200 IIM graduates opt to join the entrepreneurship bandwagon every year, while the same number of IIT students is 1,600. This itself is considered by some as self-explanatory as to why IITs are better for start-ups. The average cost of studying at IIM is around Rs 9 lakh per annum. The IITians are supposed to pay only Rs 90,000 in comparison, the equivalent of average playschool fee today. There was a proposal to increase the IIT fee, but it was deferred in October 2015. IIM graduates command a better salary as they get plush jobs with coveted brands, yet they wouldn’t have the rigour and enthusiasm for a start-up which an IIT guy would be itching to start. Once the IIM graduate lands a good job, read lucrative, it is difficult to leave it to plunge into entrepreneurship as the salary helps to pay the bills and even student loan. Since, IIT isn’t as expensive as the IIM brand, the former are better positioned to believe in their idea and be on their own. They are and can be supported by a huge, rich alumni network who range from Nikesh Arora, Vinod Khosla, Amit Singhal, Sachin Bansal, Binny Bansal, SundarPichai, Deepinder Goyal, and many others. In fact, they say out of India, it is really the IIT that gets more attention than an IIM. Having said that, there is no specific way to say that a degree from IIM means you can’t start-up yourself. Some names in the list above have a management degree as well. This makes them better positioned to look after their growing company. 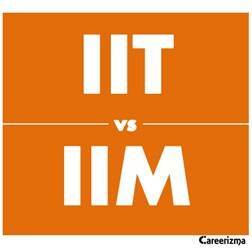 One becomes eligible to apply for the IIM is after completing his or her bachelor’s degree, but for IIT admissions, students begin preparing while they are still in school. The age at which an IIM student graduates is when he is supposed to get married, have a stable job and ‘settle’ in his life. An IIT grad has age on his side and can take time to make mistakes, and succeed in a trial and error method. Nevertheless, not all IITians end up in a start-up, most of them also opt for comfortable jobs with a decent pay package. For someone to start a business, you really need to believe in your idea and be prepared to put in the time and effort that you would if you were bringing up your child. Having stated the above theories, the one thing that ought not to be missed here is that a start-up needs the best of both the worlds: technological innovation and administrative intelligence. To have an idea is great, to get funding for it is super, but if you have an idea how to run your business, you need the sane advice of a management consultant. Hence, the best start-ups would always have some of the best minds from both the disciplines. Technical + Management knowledge = Start-up success. And one more thing. A non-IIT/IIM person can also succeed in a start-up, yet the brand your degree comes from would get your CV on top of the list for venture capitalists to see and bet on. That’s for sure.